The EZ-Mutation™ site-directed DNA mutagenesis kit employs the simplest and fastest technology available to introduce a wide variety of mutations into small plasmids. It supports plasmids up to 12 kbp without the need for sub-cloning or the availability of unique restriction sites. This technology requires the amplification of the full target plasmid; therefore, we recommend it for plasmids smaller than 6.0 kbp. For medium and large plasmids we recommend using our GenEdit™ kit (Cat# 201321 to 201323). Catalog #: 201304, 201305, 201306 for 6, 16, and 24 reactions respectively. Kit size: 8, 16, or 24 reactions. Maximum Target plasmid size: Up to 12 kbp, recommended for 6.0 kbp. Maximum insertion mutation size: Up to 100 bp in any combination. Maximum deletion mutation size: Up to 10,000 bp. Unique restriction sites requirements: Restriction sites are not required. Polymerase: proprietary FBT HotStart High Fidelity DNA polymerase. Storage temperature for kit reagents: -20C in a non frost-free freezer. Fastest mutagenesis method: It involves a single inverse PCR reaction followed by transformation to obtain mutant clones within 2-3 days. Convenience: all key reagents are premixed and distributed in single reaction tubes, ready for reaction. Cloning vectors are not required: Most mutagenesis projects involving large genes or plasmids require cloning a section of the original plasmid into smaller cloning vectors. 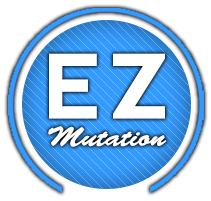 EZ-Mutation™ does not require any cloning vectors. No special E. Coli strains are needed: This gives you the flexibility to use any transformation cells of your choice. FBT Super Competent cells are shipped with the kit. Cloning, sub-cloning or restriction sites are not required: Your mutations will be introduced to your plasmid by a set of mutagenic primers. Targeted DNA Polymerization: DNA polymerization is limited only to the mutagenesis target site, not the full gene or plasmid under investigation, removing the need for full sequence verification. Simple protocol: Easy to follow instructions for both the novice and seasoned researchers. It takes only a few minutes to set up each reaction steps.